Environment and human rights campaigners are suing the Treasury over its injection of capital into the Royal Bank of Scotland last year. The World Development Movement (WDM) is leading a consortium which will serve legal papers on the UK government. It argues ministers failed to provide safeguards to block the bank from lending to companies that pollute and fail to recognise workers' rights. A Treasury spokesman said RBS "must be free to make commercial decisions". 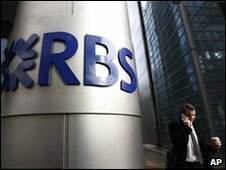 However, the spokesman added the government had taken steps to ensure the financial viability of RBS, while protecting taxpayers' investment in the bank. The campaign groups argued that if ministers could intervene to demand bank lending commitments and limits to bankers' bonuses, then they could intervene over RBS support for companies involved in controversial activities such as oil and gas drilling. WDM, along with fellow campaigners, Platform and People and Planet, said an assessment of the likely impact on human rights and the environment should have been carried out. The same groups took the Treasury to the High Court last year over its first £20bn bail-out package, seeking judicial review. The government's response was that such a restriction would have been harmful to the financial stability of the bank, and that it would be inappropriate for ministers to impose wider policy objectives on RBS. Deborah Doane, director of the World Development Movement, said of the new legal action: "It is difficult to understand why the Treasury can order RBS to increase its lending to small businesses and home owners or curb bonuses but believe it would be unlawful for it to tell RBS to phase out its lending in hugely controversial tar sands, and investing in low carbon projects instead. "This is hypocrisy on a grand scale. The Treasury has shown that is has the power, if not the will, to intervene in RBS's lending for the public good." RBS insisted it took social and environmental factors into account when assessing individual loans. A spokeswoman for the bank said: "RBS takes climate change very seriously and are one of the leading arrangers of finance to the renewable energy sector. "We are determined to play our part in the global shift to a sustainable low carbon future." However, she declined to comment on the legal action.